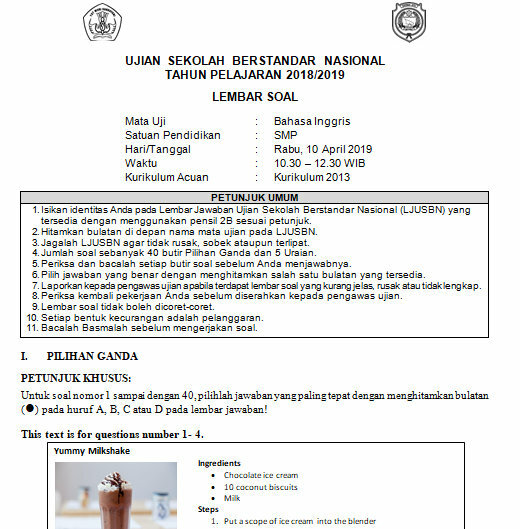 Jadwal USBN hari ketiga jam pertama adalah mata pelajaran IPS (Ilmu Pengetahuan Sosial), dan jam kedua adalah mata pelajaran Bahasa Inggris. This text is for questions number 1- 4. 1. What is the goal of the text? 2. How many ingredients do you need? 3. When do you put coconut biscuits into the blender? This text is for questions number 5 - 8. An earthworm uses his pointed head end to dig a hole in the soil. It searches for loose soil and forces the soil apart. Slowly, the worm draws the rest of its body until it disappears into the hole. The earthworm has many narrow rings which enable it to change shape. The earthworm will eat the soil if it is too hard to be pushed aside. It opens up channels through which air can enter by burrowing into the soil. Because of this, the soil will be oxygenated. The roots of plants planted in that soil can breathe. In this way earthworms act as gardeners and cultivators of the soil. 5. What is the best title for the text? 6. How does an earthworm go through a small hole? 7. Why is an earthworm called a gardener? Because it …. This text is for questions number 9 - 11. The school drama is going to organize "Cindelaras" drama cast audition. For those who are interested to join the audition, please come to our office on Monday, 22 April, 2019 at 2 pm. to register. 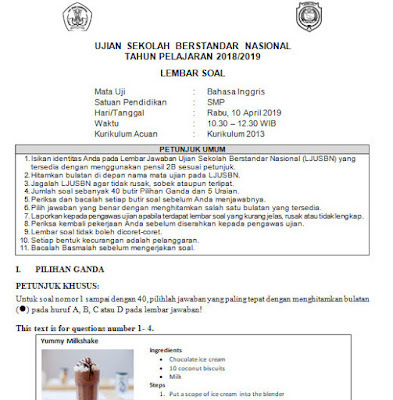 • The audition will be held on Tuesday, 23 April, 2019 at 9 am. The list of the selected candidates will be announced in a week. We appreciate your participation. 9. Why does the writer issue the announcement? To inform …. 11. Where should the participant go for registration? This text is for questions number 12 - 15. King Ranubanu had a very pretty princess. She loved plaing with water very much. One day, people of the kingdom suffered from a strange disease. A lot of people died. Physicians failed to cure the people. One day, an old man visited the King. He said that the kingdom could be free from the disease with the help of a rare flower which grew in the middle of a lake. The lake was just at Mount Semeru’s foot. However, the flower could only be taken by the princess. Sadly, the king let the princess do the hard task. After a long journey, the princess and her people arrived at the lake. The water of the lake soon attached the princess to play with it. She jumped into the lake and forgot about the task. She refused to go back to the kingdom. Surprisingly, the princess turned into a white flower. The king, sadly, took the flower out of the lake and brought it to the palace. Amazingly, people of the kingdom could be cured by seeing the flower. The flower is known as the water lily or “Bunga Teratai” in the Indonesian language. 12. What could we learn from the story? 13. What is the second paragraph about? 15. From the text, we can conclude that the princess was … by the flower the lake. This text is for questions number 16-19. He told me,”Son sometimes it may seem dark, but the absence of the light is a necessary part. 16. What is the message of the song above? A. Your parents will always be ready to help you when you have a problem in your life. B. You must go far away from home when you have a problem. C. Your parents will find you in the end even in the dark. D. You must go to slippery slope and reach your home. 17. Which statement illustrates the hardness of the life? D. Every road is slippery slope. 18. What will probably happen if you never come back home? 19. “ … over the horizon into our eyes” (line 4). What does the underlined word mean? D. An imaginary line drawn around the earth. This text is for question number 20 to 23. The place that I never forget is Covent Garden. It is one of the most popular parts of London. Tourists and Londoners, adults and kids – they all enjoy the great shops restaurants and cafes, and, most of all, they love the street performers. At Covent Garden, you can see some of the best street performers in the world. There are jugglers, clowns, magicians, living statues, musicians – the list goes on and on! Before they can perform there, performers have to pass a test (it doesn’t cost anything). The shows are free and performers don’t go round and collect money – but most people throw money into the hat! The performers can keep all the money. Sometimes the audience is small, but often big, and due to that they make a lot of money at the end of the show. 20. What is the text about? A. The musicians of Covent Garden. B. The performers in Covent Garden. C. Getting some money in Covent Garden. D. Covent Garden as a place for street performers. 21. What do the performers have to do before they can perform there? D. Throw the money into the hat. 22. What will the readers probably do when they visit the Covent Garden? This text is for questions number 24-27. 24. What is the writer’s intention of writing the text above? 25. Why do we need to have regular exercise? 26. What is the first tips of keeping our body strong and healthy? This text is for questions 28 to 30. 28. The text aims to …. 29. 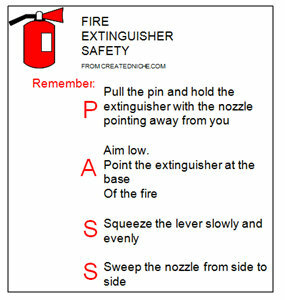 How can we put off the fire effectively? 30. What will likely happen when you aim high at the fire? This text is for questions number 31-34. 31. What is the benefit of reading the label above? B. We will know how to make the product. D. We get the detailed information of the product. 32. 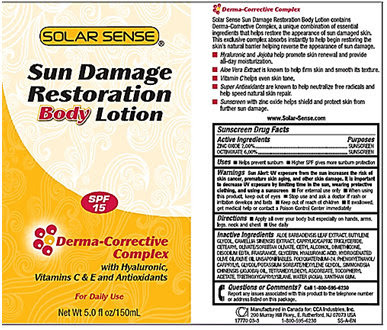 Which helps shield and protect skin for further sun damage? 33. When will we probably use the product? This text is for questions number 35 and 36. I’m sorry I can’t come to your house to do our English task this afternoon. I must take my mother to the doctor because she has a headache. What if we do it tomorrow? I will wait you in the library after school at 02.00 pm. 35. What is the writer’s intention to write the text? 36. What will likely Radit do after reading the text? This text is for questions number 37 and 38. 37. What is Bima ? He is a … . A. journalist of a magazine. C. photographer of a magazine. B. journalist of a newspaper. D. photographer journalist of a newspaper. 38. When did Bima win the competition? This text is for question number 39 and 40. Last week my school arranged a tour to a waterfall. We went to Curug Sewu. On a fine cool morning. We gathered at the school at six o’clock. Two buses had ready at school. The teacher counted the students. We were all ninety. Four teachers accompanied us and two assistants took charge of the sports things. At half past six, we got into the bus and left for Curug Sewu. We were in our happy mood. We sang cheerful songs and clapped, shouting and rejoicing along the way. At 9 a.m. the teachers served us fried rice and mineral water for breakfast. Two hours later we arrived at Curug Sewu. We kept our bags and baggages on a lodge booked by the school for us. After a full meal we got ready for sight-seeing. At first we visited Kshetra Curug Sewu. There we saw a big temple built where five rivers originate. We were surprised to see it. There we enjoyed rafting and other watersports. It was almost evening there. So we hurried up to the sunset point. We saw the whole sunset, where the sun went down on the western horizon with its brilliant colors spread in the sky. The view had a deep impression on my mind. When it was dark we returned to our lodge. The next day was kept for visiting other points and valleys. On the early morning we enjoyed the sunrise, and other sightseeing points. In the afternoon around four we went to the market. There, we enjoyed delicious strawberries and raspberries. I bought a cane stock and a bottle of honey. Then it’s the time for us to return home from journey. We were in a very merry mood returning home. I enjoyed my picnic very much. 39. What did the students do when they were all in happy mood? 40. It can be inferred that the author loves sunset more because …. This text is for questions number 41 and 42. I’m used to having pets at home because my family is pet lovers. I have kept two turtles since February 2003. I put them all in one tank in my room. The name of the male turtle is Donatello and the female one is called Rafael It is quite easy to keep them. They can survive without food for about two months. However, they need a comfortable place to live. They have to live with imported soil and plants, good water circulation and a piece of dry trunk in the aquarium. Inadequate conditions can cause not only stress but also affect their growth. The worst thing is they may even end in their death! The weapon of an adult turtle lies in its edge of the shell. He will use this weapon when he is disturbed while he is taking a nap. 41. What is the purpose of the text above ? 42. Why is it dangerous to touch the edge of the turtle’s shell when he is having his nap? For number 43 – 45, fill the blanks correctly! 43. Borobudur temple . . . thousands of years ago by our ancestor. 44. The writer and his friends returned to their lodge … it was dark there. 45. Komodo dragons are carnivores who ... to eat pigs, deer, snakes, fish and water buffalos.